You, Me and Movies: Review: Gary Oldman delivers all sorts of goods in Joe Wright's "Darkest Hour"
Did any of you catch the 2018 Golden Globe nominations? 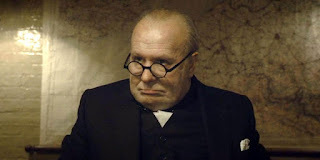 If so, then you probably saw that Gary Oldman has been nominated for his work in “Darkest Hour.” After finally seeing the movie myself, it is no surprise whatsoever that has been nominated. For me, that’s never a surprise when Gary Oldman delivers an unbelievable performance. Because, remarkably enough, this feels like something Oldman is always doing, and I can’t believe he never gets the attention and discussion I feel like he deserves. He should be the male Meryl Streep, though lots more likable. I think this because he seems to vanish in his roles all the time. How can someone watch something like “The Fifth Element” and NOT be totally taken aback when the realize the villain of that movie is Gary Oldman. Or how about his work as Dracula? How is the guy who was in “The Contender” also be the guy in “The Professional” and how is that guy the same guy from “Air Force One” or “Lawless?” My favorite example is Oldman’s work as Drexel in “True Romance.” A role wear Oldman plays a wigger pimp who is viciously ruthless. There is a verbal showdown that escalates to violence between Oldman’s Drexel and Christian Slater. I have seen the movie about a dozen times now, and that one moment still makes me tense up. When I show that movie to friends, they are stunned silent throughout the scene, then finish it with a deep sigh of relief. All in part from Oldman’s talent. Some actors only disappear into a role once, Oldman made a career out of it. That’s why I totally buy his transformation into Winston Churchill, during the early days World War II, when he was appointed as Prime Minister. 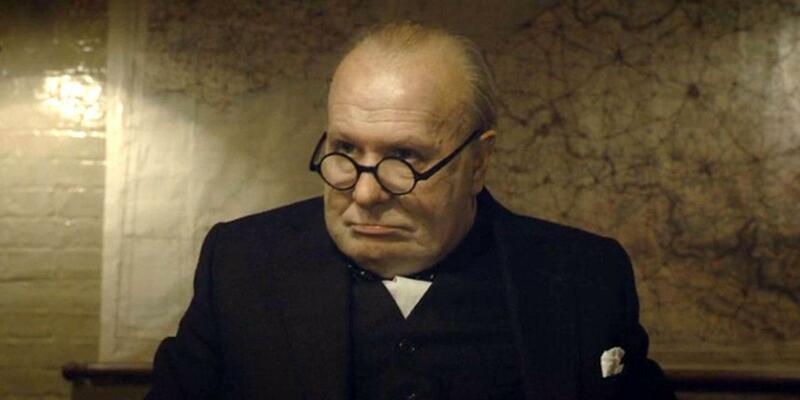 Oldman once again completely becomes Churchill, almost as if he evaporated into the skin of the man himself. It looks like Oldman put on a tremendous amount of weight, and I really can’t tell if he actually did or if that is mere movie magic. He completely transformed the way he talks, the way he moves, and he completely reinvented his mannerisms. This is what method acting looks like, and when it’s at its absolute best. Funny, because the movie is actually full of stellar performances. Lilly James has had an absolutely great year of movies. “Baby Driver” STILL makes me swoon. And now, she caps off the year with another memorable performance. Here, she plays Elizabeth Nel, who was the personal secretary to Churchill throughout the war. It plays out mostly like typical Hollywood, but it never becomes weird or awkward or romantic. And James does great enough work that their subplot counts. Ben Mendelson plays King George VI who eventually appoints Churchill to his position, and he does a fine job here. Kristin Scott Thomas plays Churchill’s wife and she’s as stalwart and stern as he is, Thomas once again displays some raw talent here. Even old Stannis Baratheon himself, Stephen Dillane appears as Lord Halifrax. Joe Wright has a keen eye for detail here. As it feels like every costume and piece of scenery is absolutely lived-in. Any time I am watching a biography film and it feels like I just stepped off a time machine, that’s a good sign in my book. I don’t like cheap looking sets and costumes, it really is distracting to me. Either it all counts, or none of it does, so I like the extra detail in these biographical films. The cinematography by Bruno Delbonnel is that typical rough-edged, rugged look that appear in most World War II movies, but its totally fitting here. The music by Dario Marianelli is powerfully suiting. Oh, and Christopher Nolan’s “Dunkirk” is a perfect companion film to this. I can’t wait to have both in my possession and have a nice double feature.